I have one more gorgeous matte polish to show you from the SinfulColors Leather Luxe collection, SinfulColors Cold Leather. Cold Leather is a rich saturated blue in the same family as Essie Butler, Please and it's relatives, but in matte form. 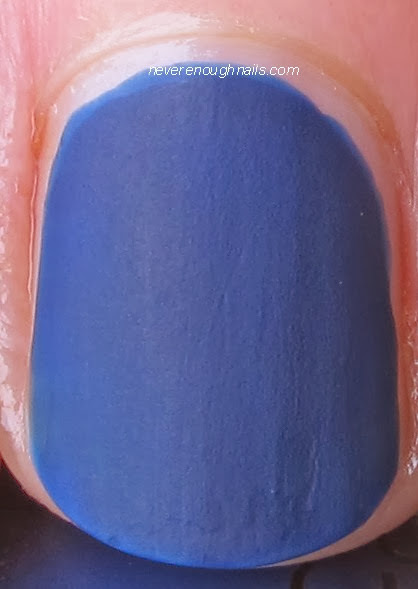 I love this kind of blue and it's really gorgeous as a matte polish. I know you can always put a matte top coat over a regular polish for a similar effect, but it's so nice and easy to have it all in one polish. I love mattes for just throwing on when I'm in a huge rush. They dry so quickly and there is no top coat needed! This is two coats of Cold Leather. It was very nicely pigmented and has a good formula. You can see on my ring finger than I applied one stroke of polish a little too late, when the polish underneath was already mostly dry. This caused that bit of lumpiness there. Just make sure you apply just two or three brushstrokes per nail and then allow that to dry fully before you go back over it again. The SinfulColors Leather Luxe collection is available now at a drugstore near you!